A ferry ride took me from Pier 1 near San Francisco’s Ferry Building to Alameda and from the ferry terminal there it was just a couple of minutes walk to St George distillery. This was where I visited the distillery a couple of years ago, although they have now moved to a larger premise nearby. 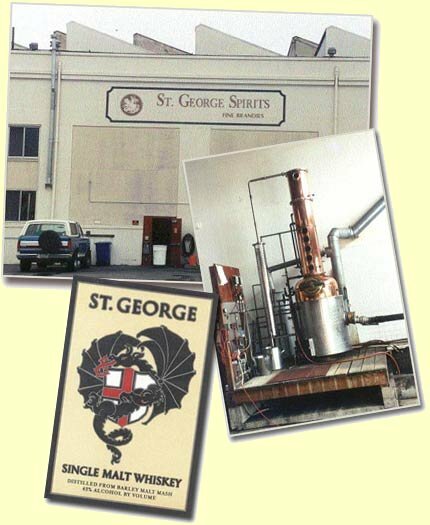 Responsible at the distillery for a range of spirits, including St George Single Malt Whiskey are Jörg Rupf and Lance Winters. Lance is one of those rare people who really consider distilling as an art form, so meet one of his creations! St George is distilled in a Holstein still, a still type normally used for distilling eaux de vie. On top of the small (65 gallon) copper pot is a column which contains a series of plates, allowing fine-tuning of the distillation process. The mash is 100% malted barley, but no peat is used for drying the malt. Lance uses the smoke of beech and alder wood and this wood smoke gives a very different kind of smokiness to the finished product: much sweeter & more fragrant than peat smoke. There is only one distillation and maturation takes place in ex-bourbon barrels, French oak casks and a small proportion of port pipes. The first bottling of St George a few years ago was 3 y.o. and one of the most fruity and elegant whiskies I’ve ever tasted. Remarkably smooth and very fragrant, with fructose-like sweetness and drier, more nutty notes. Recently St George ‘Lot 3’ was released, which is still technically a 3 y.o. (the age of the youngest whiskey in the vatting), but contains a significant amount of 4 to 6 y.o. whiskeys. Plus that the wood smoke influence has been increased. ‘Lot 3’ is fuller, richer & clearly more malty. Its fructose-sweetness has been toned down a bit and it has gained a subtle, almost incense-like, sweet smokiness. I hope Lance will consider a cask strength bottling in the near future.